I've been running algae scrubbers for about a year now, first on a 40 breeder, now on a 55 reef. My current configurations hangs a 10w hybrid red/blue LED outside one end of a re-plumbed 6 gallon 3 chamber acrylic refugium. I've just added a 33 long above the 55. 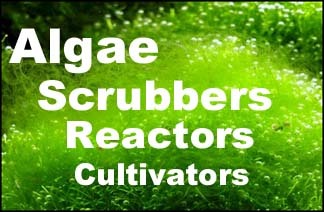 The algae scrubber is the only filtration in the system, other than live rock. An in-tank overflow pumps water from the 55 up to the 33. A DIY overflow siphon drains the 33 to the scrubber end of the refugium. The refugium gravity drains back to the 55. I run 120 lbs of live rock in the 55 on a 4-5" crushed coral substrate over a 1" plenum. The 33 has a 3" reef sand bed, no plenum. The scrubber uses an 8"x8" 1/4" mesh poly screen zip tied to a 6" coarse air stone. The screen sits in front of a cut-to-fit ceramic tile that has coarse crushed coral bonded to it. It serves as a pod and rotifer farm as well as a light barrier for the rest of the refugium. It also grows algae. I have to say that after 40 years in the hobby I finally have the tank I spent a fortune on gadgets to achieve. It is stable, coral growth is phenomenal, I have enough pods to support both a scooter blenny and a very fat mandarin. All I do is top off the water and clean the screen every few weeks. No skimmer, no carbon, no GFO, nothing. I supplement with iron/manganese and a little coral-vite each week. I'd never go back to any other waste management system. Very nice; my goal too for a tank. Checked the screen last night. Right in the middle opposite the light was a 3/8" diameter clump of bright green very bristly stuff that can't be anything but turf algae. First appearance of turf in any scrubber config I've had. When I pulled the screen for a better look, I managed to dislodge it by accident. I've put it back in the chamber, I'm hoping it will reattach. Will try and get some pics tonite when I get home.